RMI has litigated substantial subrogation recoveries on virtually every type of property loss throughout the entire state of Ohio. 24/7 Hotline. We we are proud that insurers bring our firm in immediately at the time of the loss. We analyze every angle! All potential recovery sources are reviewed. RMI has participated in hundreds of scene and forensic lab examinations involving fires, explosions, water losses, collapse and construction defect cases. It is not unusual on assignments for our firm to spend multiple days on site ensuring what must be done for a successful recovery. RMI prides itself in recoveries involving defective products. The firm has extensive experience in litigating and recovering on product failures, with a thorough knowledge of Ohio Product Liability law. Our attorneys include counsel with an engineering background, along with a firm member who has taught product liability law at the university level. The firm has litigated defects involving most household appliances, commercial equipment, and vehicles. RESULTS! Check out our proven track record of recoveries by settlements and trial in multiple areas such as fires, expolsions, construction defects, water losses, product liability and other property losses. The firm has worked side by side with the proper experts. Through the years we have worked with most experts who work in Ohio, the state fire marshal’s office, city fire investigators and other government officials. RMI has a proven track record coordinating successful NFPA 921 compliant scene examinations that have led to significant six and seven digit recoveries. Electrical fires (NFPA 70 - National Electric Code). Fires and explosions involving gas and propane (NFPA 30 - Flammable and Combustible Liquids Code / NFPA 58 - Liquefied Petroleum Gas Code). Hot Work (NFPA 51B – Standard for Fire Prevention During Welding, Cutting and Other Hot Work). Water Based Fire Protection Systems, NFPA 17 - Dry Chemical Extinguishing Systems. Ohio Building Code (Construction defect cases, collapses and retaining wall failures). Immediate contact with the insured, assigned field adjuster and expert. Investigation and insurance team approach. A checklist and time line following our formula for a successful and NFPA compliant exam. Working with the people we know after years of experience: fire investigators and other experts, front line adjusters, your subrogation unit, insureds, government officials and property managers. Guidance to adjusters on the fine line between mitigation of damages and spoliation. Securing the scene and preservation issues. Avoiding spoliation and potential bad faith claims. Proper and NFPA compliant notice to parties and others impacted by the loss. Working with the proper expert on protocols and a recovery strategy. Identifying all potential subrogation targets (known and unknown). 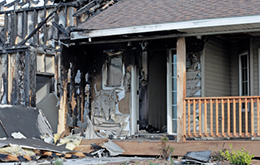 Thorough knowledge of the appropriate codes and laws that are relevant to the loss. Applying the facts to the appropriate law or standard for a successful subrogation recovery. Our firm has been asked to be presenters at numerous industry seminars on proper, safe and successful scene examinations. In addition, the firm has been presenters in "live burns" and other educational programs for clients in the subrogation industry. For after hour losses, the firm has a 24 hour contact on new losses (David Matejczyk / 440-829-7689).